Buying eggs at the grocery store isn’t always as easy as it used to be. That’s partly because there are so many kinds of eggs to choose from these days. From cage-free to organic, traditional to pasture-raised and more, you have plenty of options when it comes to eggs. If “pasture-raised” stuck out in the list of egg types mentioned above, you may be asking yourself, “What does pasture-raised mean?” It’s simple — what makes eggs pasture-raised is the fact that hens living on a pasture produced them. Even though modern chickens have evolved from their ancestral cousins over the years, hens are still near- insatiable omnivores. If they lived in the wild, chickens would still eat almost any food they had access to. When chickens are raised on pasture, their experience closely mimics how they’d live in the wild — and their diet reflects it. Instead of being fed what would probably be a corn-based diet in a cage or cage-free environment, pasture-raised hens enjoy the outdoors as they feed on natural grass, seeds and insects. In general, pasture-raised eggs are laid by chickens that enjoy an outdoor lifestyle that’s cleaner and less stressful than alternative environments. These hens also enjoy plenty of fresh air and exposure to the sun. We wanted to go a step further in providing our customers with a superior egg. 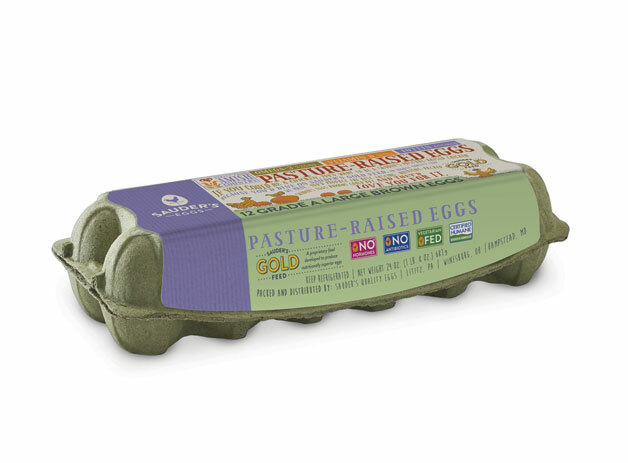 At Sauder’s Eggs, as part of our renewed commitment to sustainability and lowering our impact on the Earth, we package our pasture-raised Gold Eggs in the GreeNest carton. For this eco-friendly packaging, 50% of the GreeNest carton is made from all-natural grass fibers that have never been touched by pesticides or fertilizers. This green carton has allowed us to reduce our carbon footprint by 10% compared to our other packaging methods. Our GreeNest cartons are recyclable, home compostable, and biodegradable because they are made entirely from renewable resources. We only have one planet to call home, and we believe every person should do their part in protecting our Earth. At Sauder’s Eggs, we are constantly looking for new ways to lower our impact on the environment. You can’t miss these bright green cartons the next time you’re at the supermarket. Be sure to pick up Sauder’s Gold Eggs to enjoy the health benefits and delicious taste. Now that you’re familiar with pasture-raised eggs, you’re probably wondering where you can purchase some. Luckily, you can use our convenient store locator to find a retailer near you that sells Sauder’s pasture-raised eggs. Sold by the dozen, our pasture-raised eggs are great on their own as a main course, as a snack or as part of a side dish. With a shelf life of 45 days, you’ll have plenty of time to enjoy your Sauder’s pasture-raised eggs before they expire. Count on Sauder’s to provide the freshest eggs available. We normally collect our pasture-raised eggs, process them and deliver the eggs to retailers on the very same day. What’s better than fresh, pasture-raised eggs loaded with protein and nutritional value? Nothing we can think of! Use our store locator to learn where you can purchase Sauder’s pasture-raised eggs now.